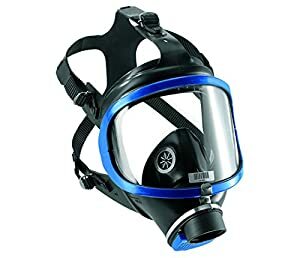 10 Best Gas Masks Reviews for Your Protection in 2019! Gas mask is a very important survival gear. It protects you from breathing in the toxic or polluted air. Gas mask is a portable personal air purifying device, which you can easily put on when needed. It can be used while working in the dangerous environments, during natural disasters or civil riots, etc. What criteria should you use to pick the best gas mask? First of all, take into account the conditions you are going to use it in. There are a lot of masks that will protect you from debris and smoke, but not all of them can protect you from nuclear, biological or chemical warfare. CBRN-rated gas masks protect you from chemical, biological, radiological and nuclear warfare agents. They use CBRN-rated filters and are covered with the special coating for the maximum safety. These masks are usually designed for military use and are quite pricey. But if you need full protection from any kind of danger, you might be interested in a CBRN-rated mask. Gas mask filters work for a limited period of time. 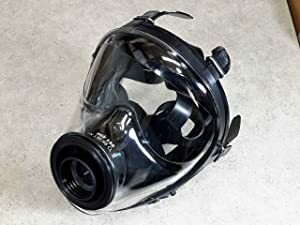 Depending on the filter, such mask can be effectively used up to 8 hours. You should have the ability to easily change the filter when needed. Filter replacement should be quick. Almost all gas masks on my list are compatible with 40mm NATO filters. A good idea will be to have a couple of extra filters just in case. Please note that gas masks should not be worn permanently. They are designed as a temporary solution to the problem. Additional user comfort is provided in some masks for the extended use, but extended doesn’t mean permanent. 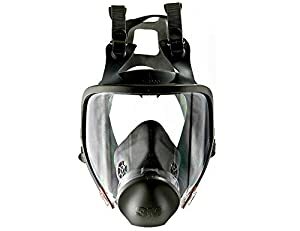 If you wear a gas mask at work, then you might be interested in a lightweight mask for a long-term use. 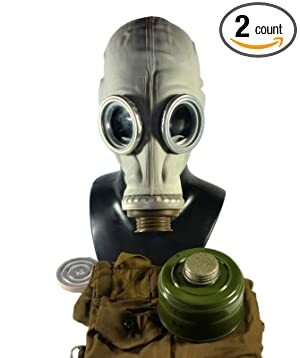 This is definitely the best military gas mask on the market. It is US NIOSH-certified, which means that it provides the maximum protection from almost all kinds of danger. This mask will protect you from nuclear, biological and chemical warfare (including mustard gas and sarin gas). It is a well-constructed full-face mask which comes in a universal size. This mask perfectly fits almost all facial sizes. The item itself is made from skin-friendly EPDM with a double-layer face seal and triple sealing edges for additional protection. 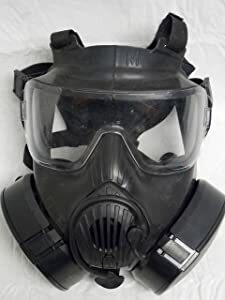 This is a NATO 40-mm NBC Israeli & NATO Military Spec gas mask (NBC stands for nuclear, biological and chemical protection). It is made specifically for the military use. This item goes with free survival kit checklist and one included filter. At the same time, it is compatible with all 40mm gas mask filter cartridges. That’s why it is reliable, durable and easy to maintain. This mask is quick to put on and off, because it features five-point banding. The viewing window is made from high-quality Plexiglas and provides a 180-degree viewing angle. Another advantage of this item is a built-in speech diaphragm for the convenient communication. 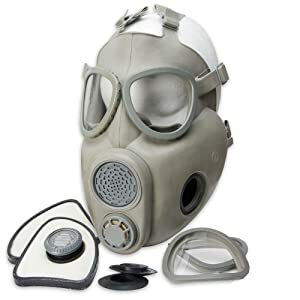 German CBRN Civilian Case US NIOSH Approved Gas Mask is the best gas mask for shtf. It comes in multiple sizes and is suitable for both adults and kids. This mask is constructed to provide the maximum protection, comfort and personal safety. It meets the new NFPA 1981-2007 standards. This item ensures extremely wide field of vision for additional reliability and practicality. 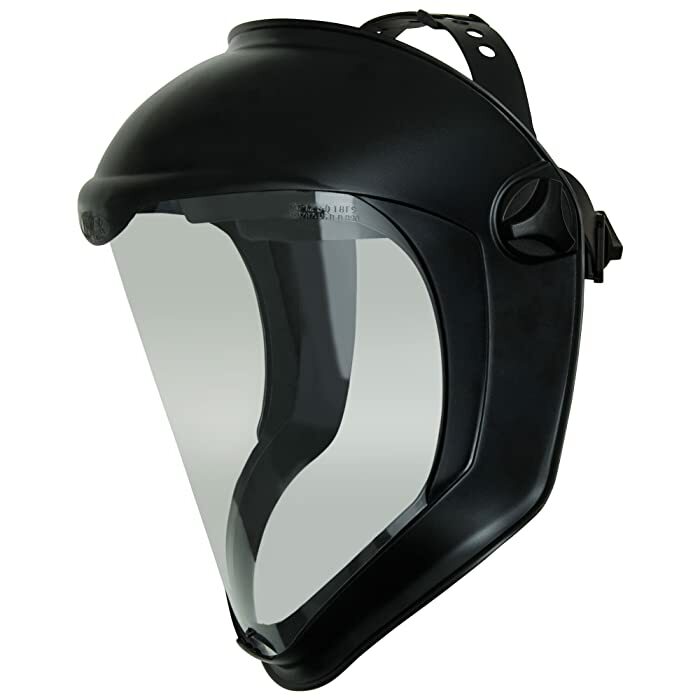 The visor is produced from distortion-free polycarbonate, which is a very durable material. Additional protection is provided by anti-scratch coating of the visor. The air system of the mask prevents internal fogging. The mask is made from EPDM rubber material. It is durable and comfortable. The perfect mask seal is provided by triple sealing edges. 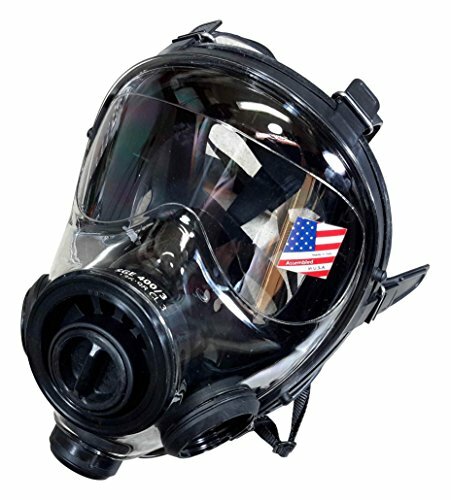 This mask is specifically designed for firefighters, so you can be sure that it has awesome protective capabilities. It goes with a free survival kit checklist. This is a well-built anti-fogging hard coat mask. It provides full protection of your face with the built-in chin protection and the top-of-head coverage. It protects you from airborne contaminants, falling objects and chemical splashes. Good visibility is ensured by the high-quality optics. The visor is produced from polycarbonate and is covered with anti-fog coating. The ergonomic design makes this mask lightweight and perfect for extended use. This mask provides different kinds of adjustment for the maximum comfort of the user. You can adjust the visor, placing it nearer or farther from your face. The fit is additionally customized with the dual-position setting. The visor can be easily replaced. There are different visor options available: clear uncoated, clear anti-fog/anti-scratch, shade 3.0 and shade 5.0. So you can pick the perfect visor according to your preferences. The headband is breathable, washable and can be removed. These features make the maintenance quick and easy. Please note that this mask must be worn with safety eyewear. It is compatible with most goggles and respirators. This mask features no metal parts and is perfectly suitable for using it in the electrical work environments. It meets ANSI Z87+ and CSA Z94.3 standards. 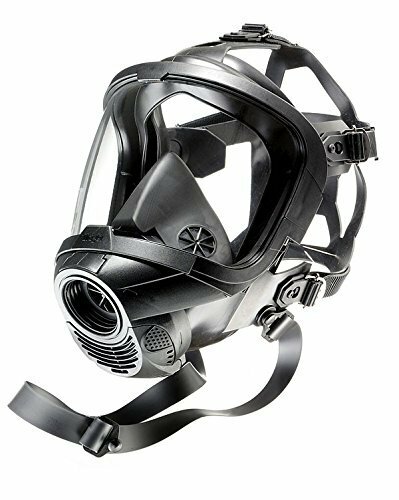 This mask is produced from high-quality strong thermoplastic polyurethanes (TPU), providing durability and reliability of the item. This is a sturdy and shock-resistant material. The lens of this mask is strong enough to resist the impact of 5 joules. This mask fits perfectly and features EVA head cushioning pad for user comfort. 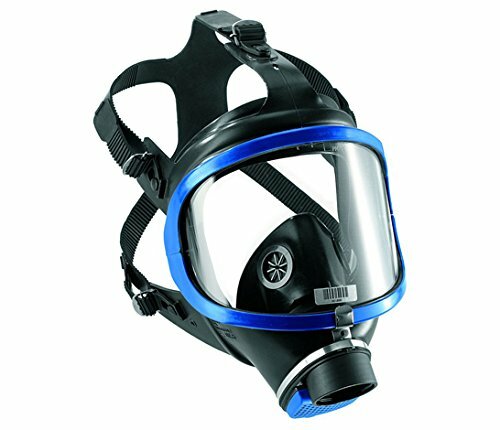 The high-density nylon straps keep the mask stable in the right position. It is a good choice for airsoft game, tactical essential, outdoor recreation, as well as leisure. This item can be used in the wide temperature range (from minus 10 degrees Celsius to 42 degrees Celsius). It passed ANSI Z80.3 drop-ball test. Another advantage of this item is anti-fog turbo fan system. The fans are turned on by the button on the outside of the filter to prevent internal fogging. I should definitely name Rubber Mask for Respiratory Protection among the best cheap gas masks. This is a Soviet Russian gas mask GP-5M produced from high-quality rubber. It comes in large sizes (67.5 – 70.5 cm). This mask goes together with a filter, carrying the bag and anti-fog lenses box. Protection from fogging is provided by small vents under the glass eyepieces. The mask fits tightly and prevents any leaks. It features a voice diaphragm. This mask is designed precisely for GOST filters, but it is also compatible with a 40-mm NATO filter. That’s why you can easily replace the filter when it expires. 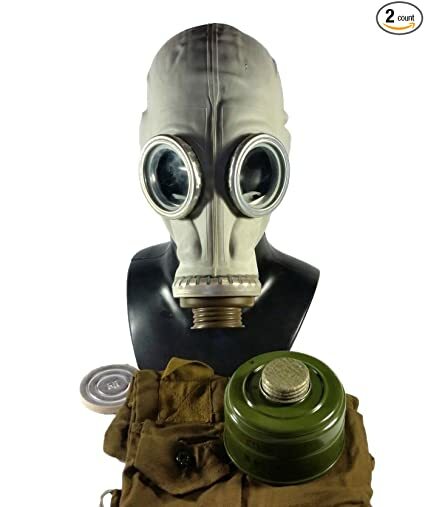 Czech M10 Gas Mask with a Carry Bag is thoughtfully designed for your protection and comfort. It comes in adult size and is highly adjustable, so you can adjust it according to your preferences. The mask fits well and holds the position tightly. This mask is one of the best cheap gas masks, but you need to know that it was produced about 20 years ago. It is worth the money paid for it, but please mind that it won’t fully protect you from all kinds of danger. The item comes together with a bag, spare goggles, straw and filters. 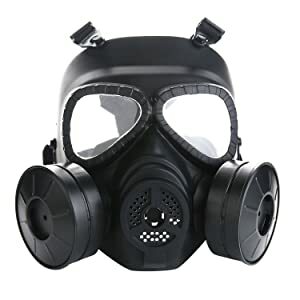 Please note that it is not CBRN-rated, which means that the filters will definitely protect you from tear gas, smoke or air pollution, but not from chemical or biological warfare agents. One of the best military gas masks is Israeli & NATO Military Spec Full Face Gas Mask Respirator. It combines ergonomic design and the functional use. This mask is sold without filter and drinking tubes (they are sold separately). It is compatible with all 40-mm gas mask filter cartridges. The advantageous feature of this item is that all the masks are brand new – they were produced in 2017. They come sealed and with factory instructions. The mask is made from butyl rubber and the visor is made from polycarbonate. These are durable and reliable materials, which can resist chemical and biological warfare agents, but only together with a CBRN-rated filter. This item is lightweight and compact – you can easily transport it and comfortably wear for an extended period of time. The visor provides a wide field of view for user comfort. SGE 1 Gas Mask/Respirator 400/3 is well-constructed, NBC-rated gas mask which is compatible with 40-mm NATO filters. It is designed according to the NATO specifications and is assembled in the USA. This mask provides full-face NBC protection. There are three filter ports for the maximum protection and air ventilation. The mask is sold without a filter and drinking tube (they are sold separately). The position of the gas mask is highly adjustable to your needs, because of six adjustable straps. This mask ensures a wide field of view for user comfort. Internal fogging is prevented by the controlled air flow. The visor is produced from strong polycarbonate and is heat-resistant (up to 800 degrees Celsius). It won’t catch fire or melt, so you can safely use it in the high temperature conditions. The visor is covered with a special anti-scratch and chemical-resistant coating. That’s why it is one of the best military gas masks for a reasonable price. This is a well-constructed respirator made from silicone and thermoplastic elastomer. Thanks to the ergonomic design and the high-quality materials, this item is lightweight and portable. It is available in six different modes. It meets ANSI Z87.1-2003 standards of face and eye protection. This mask is designed for commercial or residential use and can protect your eyes from different flying particles, certain airborne contaminants and debris. The lens of the item is big enough for a wide field of vision. It increases safety and productivity of the use. The mask is easy to maintain and clean. There are two modes available – air-purifying and air-respirator modes. Internal fogging is reduced by center adapter. 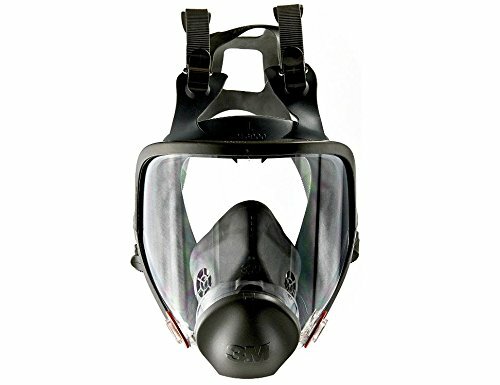 This respirator is suitable for long periods of wear, because it features 3M Cool Flow valves. This mask provides perfect face seal. It is comfortable to wear and easy to use. There is a possibility for you to wear it with the glasses underneath. Avon Full-Face Respirator M50 Gas Mask is definitely one of the best gas masks on the market, because of its advantageous features. First of all, it provides CBRN NBC-defense, which means the maximum protection against CBRN agents. It features an interior drinking tube for user comfort. The visor is made from high-quality polyurethane, which is scratch- and impact-resistant. It also provides a panoramic field of vision. The visor is compatible with weapon sights. If needed, prescription lenses can be mounted inside the mask. The mask is flexible and comfortable for extended use, because it is made of chlorobutyl rubber silicon blend. It comes with the gray carrying case and the clear lens. Please note that the filters are sold separately. I hope that this article was useful, and now you have all the necessary information about picking the best gas mask. When it comes to protection from airborne contaminants, gases, debris and chemical splashes, there is nothing better than a full-face mask. You can use it while working in dangerous environments and during risky accidents. 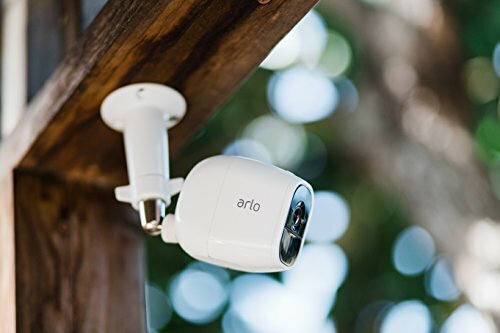 If you are interested in increasing your privacy, you might want to check this article about the best hidden camera detectors.